IN abroad, especially in China, Japan, France and Italy, motor canopy or roof is already a thing that is not weird anymore. However, in Indonesia, there are still many who do not understand it. 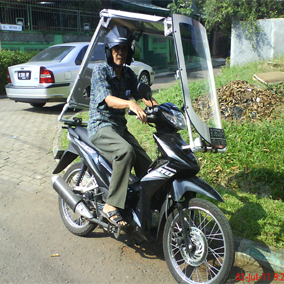 One or two are Indonesian citizens who have made a canopy motor, but usually only for scientific purposes, for hobby or just for personal gain. I became so. Originally made canopy motor only for personal gain. Then it became a hobby. It could develop into an exciting new business and have enough prospects. To understand the motor canopy, then the following questions and answers that I gathered from the community, Facebook, SMS, telephone and others. For what is put on the motor canopy? What are the advantages canopy motor your creation? To protect the driver and pillion not to rain, not too hot, not subject to wind and no dust. 1. Can be folded. Easy installation and uninstallation. 3. Framework of the canopy could be raised/be lowered as needed and can be “setting” for one or two people. 6. If the canopy is broken, easily replaced with acrylic, polycarbonate, mica, plywood melamine, canopy houses, thick plastic sheets, tarps, etc..
9. Easily controlled (mild, stable, shock-resistant, comfortable and enjoyable). Can reach speeds of 70km / h (one person) or 50km / h (two men) with stable. 10. Traffic does not violate the Act 22 of 2009. « MOTOR : Amankah Mengendarai Motor Berkanopi/Beratap?